I cannot believe I have not included khoresh fesenjoon خورشت فسنجون in my Iranian stews yet! 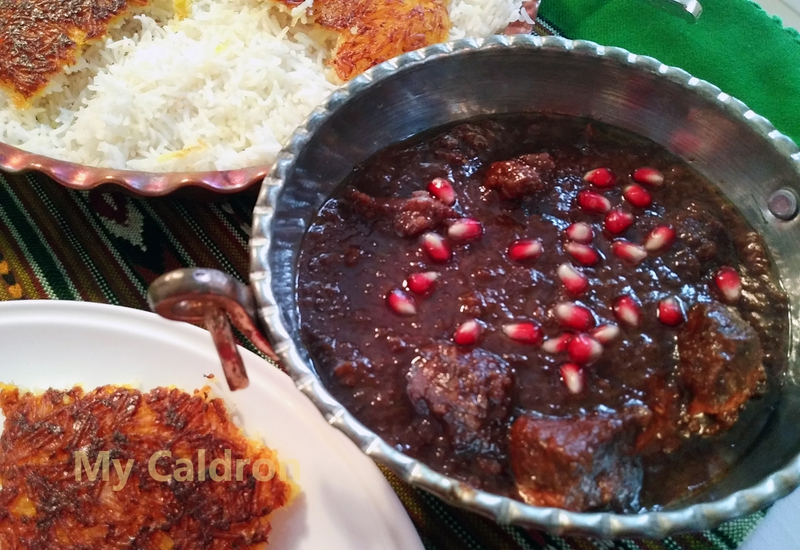 This traditional stew, made primarily with ground walnuts and pomegranate paste or molasses, with a sweet-sour taste, deep aroma and rich flavor is quite unique among other Iranian stews and is regarded a fancy dish served at special occasions and for special guests. A specialty of Northern Iran, fesenjoon is traditionally cooked using duck meat. Nowadays people use chicken breast or tights instead. Or for a vegan version simply skip the meat step and still get a rich and flavorful stew. There are certainly more than one method in making a good fesenjoon, but below is just one of them! Pass walnuts through a food processor or blender and process until you get fine clumps (or coarse powder). 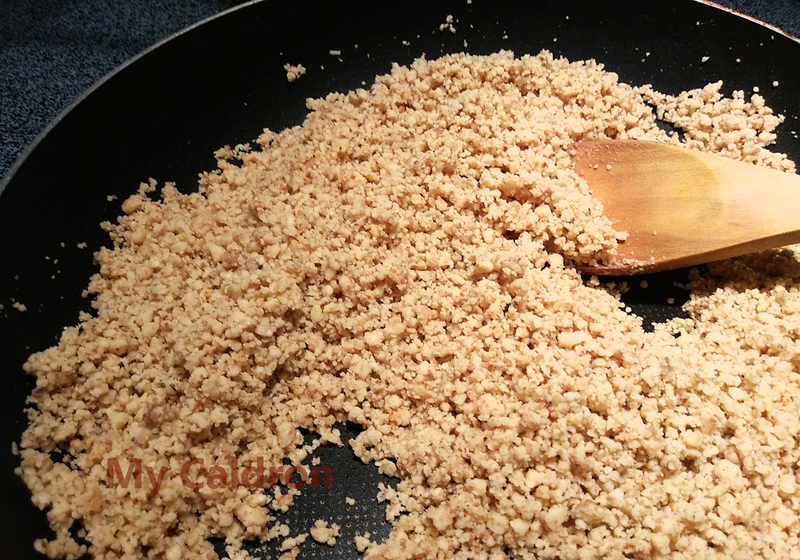 Add the grained walnuts in a dry frying pan. Sauté over medium heat for about 10 minutes or until you get a caramel color and can feel the smell of the walnut emanating from the skillet. Stir constantly and be careful not to burn the walnuts. Add 2 and 1/2 cups of lukewarm water to the frying pan and mix. Cover with the lid and reduce to minimum setting. Simmer for 20 minutes. In a medium size pot, warm oil and add chopped onions. Fry until translucent. Add chicken pieces and fry until all sides of the chicken pieces change color. Add salt, pepper and turmeric and continue frying for another 2 minutes. Add walnut paste to the main pot and simmer for half an hour with half closed lid ; leave a wooden spoon touching the bottom of the pot all the time. Add pomegranate paste to the main pot and simmer for another half an hour. Taste for adjustment. Your fesenjoon should taste sour-sweet. Depending on the brand of the pomegranate paste you have used and also depending on your own preference you might need to add a bit more pomegranate paste for added sourness. Or you might need to stir in brown sugar to get more sweetness. Also, at this stage your stew should look settled, dark and thick. If not, close the lid and simmer for another 20 minutes. Five minutes before serving, add saffron liquid. This would be for extra aroma and a deeper darker color. You could always garnish with fresh red pomegranate seeds. Serve hot with plain or saffron rice cooked Iranian style and enjoy this flavorful, rich and majestic Iranian dish!